← Bicycling in Beijing Traffic . . . The Mid-Autumn Festival was this past weekend. This also combined with Teacher Day, which allowed for a three-day weekend. The Friday before Teacher Day, which was Saturday, the school hosted an amazing banquet at a hotel; I noted this earlier. Then, the evening of Teacher Day itself, the principal of the school hosted a private dinner for the teachers of the International Division. This was a truly elegant affair, in which we were treated to an assortment of wonderful food at a very large circular table, around which sat about15 or 16 individuals. There were toasts, good conversations, and, afterward, tea in a separate tea room. That Sunday I met my friend Chang for church at 8am, and had a relaxed time with her, learning more about China and the language. She had graciously ordered me a Chinese-English, English-Chinese dictionary for me, which will be of great help as time goes on. She also helped me find a very good, and complete, version of The Dream of Red Mansions, a Chinese classic. At 2500 pages it ought to be a classic! I have not been able to start it yet. That afternoon, another colleague of mine, David Lasson, and I were given a four-hour walking tour by a group of students. 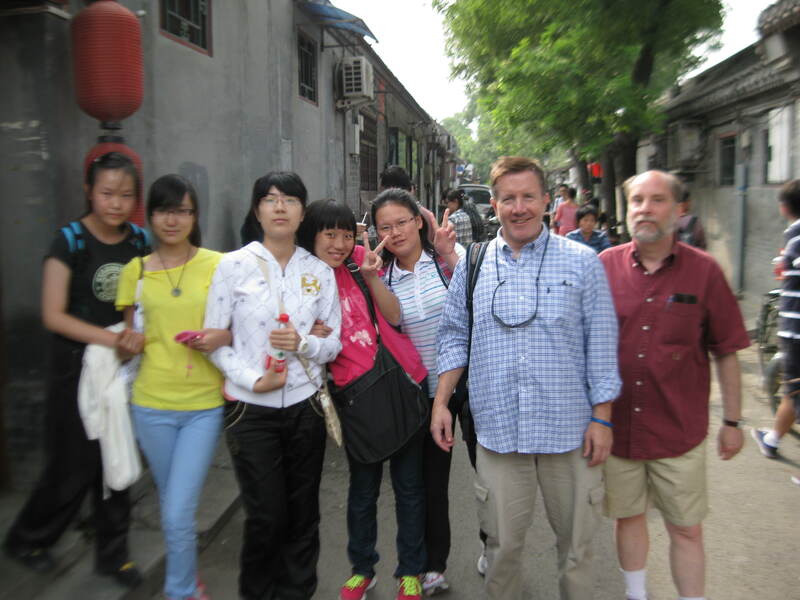 This was a tour of a very famous hutong (alley) that used to be the home of nobility and the wealthy during the some of the dynastic periods. Now it is a very, very crowded shopping street, but it still bears the marks of history. That a group of 6 students would take 4-5 hours out of their day to host an afternoon like this speaks highly of education in China, and of the students themselves. On Monday I got together with the daughter of an old friend from the military, whom I haven’t seen in about 30 years! She is a senior at the Naval Academy, and is doing a semester here in Beijing. I had never seen her before, obviously, and it was wonderful to meet her, and through her to hear about her father. This afternoon, I went over to observe the after-school Model U.N. organization at work. Keep in mind that this group has its own lecture hall at the school. Within about 5 minutes of being there, I had been asked to be the English adviser to the group in order to help the students with English wording and phrases as they prepare for their events. I was at once surprised, but I am also incredibly honored to be asked to do this. Beijing. It’s an amazing city. The weekend is soon upon us — and it will be cooling off! The Lord has clearly appointed and prepared you for just such a season… to be blessed and be a blessing, to bear fruit that glorifies the Father. Well done, good and faithful. Stay the course, abiding in the Master’s love. Thank you for participating in my time here in China, even if from Texas! And thank you for your words of encouragement. Hi Dr. Petite! It’s great pleasure to come across your blog. Hope you will enjoy your time here in Beijing! I’m the father of one of your students in Section 2.